Clerk of the Court Michael Jeanes and County Attorney Bill Montgomery recently announced that their two-year joint effort has resulted in victims of crime cashing more than $1 million in restitution checks. Tens of thousands of criminal cases make their way through the Superior Court in Maricopa County each year. Victims often move without notifying the Clerk’s Office, resulting in the Clerk holding restitution money. The County Attorney’s office locates victims during non-duty hours and when an address is obtained, the Clerk’s Office sends the funds. In 2010, the Clerk’s Office was holding more than $3 million in pending restitution for more than 4,000 victims with incorrect mailing addresses. Last year the Victim Locate Program was awarded an Achievement Award from the National Association of Counties, providing national recognition for this innovative program. In addition to the Victim-Locate Program, there is a link on the Clerk’s website called “Finding Funds” for court-ordered restitution monies or assets owed to individuals or businesses. Claim forms can be faxed or mailed to the Clerk’s Criminal Financial Obligations Unit. To search for funds, go to http://www.clerkofcourt.maricopa.gov/Unclaimed/default_new.asp. Unclaimed funds are sent to the State Department of Revenue as unclaimed property. Victims should update their address with the Clerk in writing by sending their name, case number(s) and old and new address information by mail to: Clerk of the Court, ATTN: CFO, 201 W. Jefferson, Phoenix, AZ 85003 or by emailing their information to CFOResponse@mail.maricopa.gov. The Clerk’s Office will begin the transition from paper records to an electronic court record (ECR) in the juvenile case type. The ECR has been the official record in adult case types since January 1, 2007 when the Clerk stopped maintaining physical case files. The Juvenile ECR will be implemented in phases from now through 2013. Phase I begins October 1, 2012 with scanning all newly-filed documents in juvenile guardianship cases (JG case type). No paper case files will be created for juvenile guardianship cases that are initiated on and after October 1. The ECR will be the official record. For juvenile guardianship cases that began before October 1, paper documents filed before that date will remain in the case file and subsequent filings will only be maintained in the ECR. Minute entries in all juvenile case types, regardless of the date the case was originally initiated, will be available only in the ECR. Minute entries signed on paper will be scanned into the ECR and unsigned minute entries will be automatically filed into the ECR. This project does not change the confidentiality of juvenile court records. Access to records remains the same, only the format is changing. Juvenile records are available at the Clerk’s juvenile facilities at Durango in Phoenix and on Lewis Drive in Mesa. Due to a legislative change and implementation by Maricopa County, the Clerk’s Office and the Superior Court in Maricopa County will be OPEN for business on Monday, October 8 (Columbus Day). In exchange, the Clerk and Superior Court will be closed on the Friday following Thanksgiving. In addition to eFiling options you may have, the Clerk of Superior Court in Maricopa County has external filing depository boxes available around the Valley for non-business hours filings. See http://www.clerkofcourt.maricopa.gov/alternative_filing.asp. Check with the court in each county where you file to determine their days and hours of operation. Last month’s Brief incorrectly cited the general legislative effect date for the changes to administrative review hearings appealed to Superior Court. The provisions of Senate Bill 1193 become effective July 1, 2013. 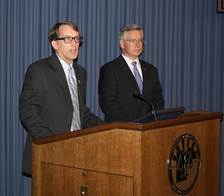 The full text of the bill can be read at http://www.azleg.gov/legtext/50leg/2r/laws/0322.pdf.